In 2018, mobile payment in the Chinese outbound tourism market saw an increase in both the rate of use and the proportion of transactions. More than two-thirds (69%) of Chinese tourists paid with their mobile phones while abroad, up 4 percentage points from the previous year. On their most recent trips overseas, Chinese tourists surveyed paid for 32% of transactions using mobile payment, overtaking cash for the first time. Traveling abroad is no longer a luxury for many Chinese citizens as they are now enjoying rising incomes and better living standards. According to the latest statistics from the China Tourism Academy, Chinese tourists made 140 million outbound trips in 2018, up 13.5 percentage points year-on-year. This robust growth gave rise to a new barometer with which to gauge China’s economy and its ever-changing consumer market, especially in regard to heated discussions on whether Chinese consumption is upgrading or downgrading, a topic that has made headlines across China in 2018. Nielsen and Alipay have jointly issued a report titled 2018 Trends for Mobile Payment in Chinese Outbound Tourism. 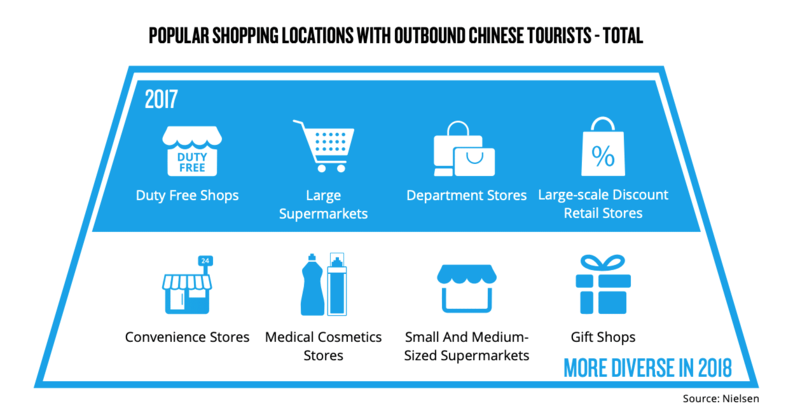 Based on a survey of 2,800-plus outbound Chinese tourists, this whitepaper represents the latest trends and consumption habits of these travelers in overseas markets. The whitepaper provides a perspective on mobile payment use cases and the developments in outbound tourism consumption by Chinese tourists. It also examines local merchants’ attitudes to and outlook on Chinese mobile payment services. 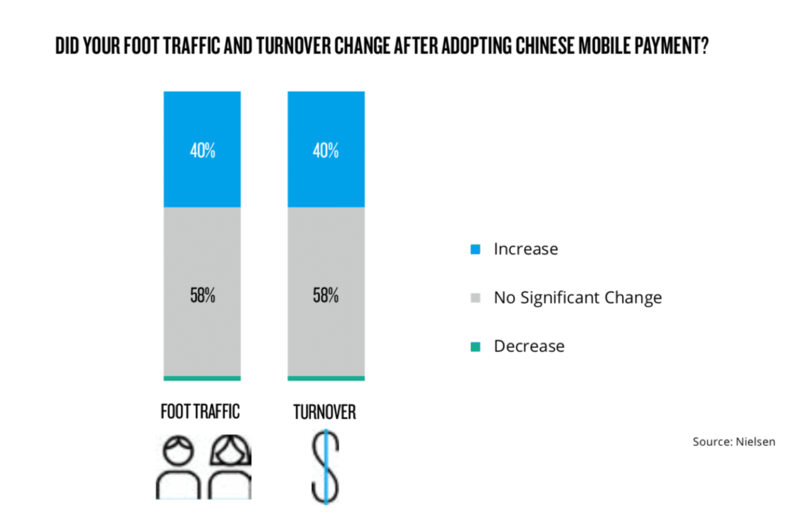 The paper also offers a rare window into understanding the impact that Chinese mobile payment solution has on local businesses, capturing the benefits that local businesses experience after connecting to Chinese mobile payment, as well as their outlook on future developments and challenges. Evolving demand: chinese tourists are becoming more frequent and diverse travelers, as well as more experience-and-quality-oriented shoppers. Outbound travel has become more prevalent and diverse for Chinese tourists. Short-haul visits to China Hong Kong SAR, China Macao SAR, Japan, and South Korea have become the norm for first-tier city dwellers; second-tier city residents are driving the growth in outbound tourism; while Chinese tourists born between 1990 and 1999 tend to be more intrepid travelers, often exploring more exotic destinations such as Central Asia and the Nordic countries. Consumption patterns remain largely unchanged from the previous year, with the top three expenditure categories remaining as shopping (25%), accommodation (18%) and dining (16%). Having said that, Chinese shoppers are becoming noticeably more quality-oriented, often basing their buying decisions on the quality of the product. They are also moving more towards boutique shops to find products they normally wouldn’t find at home and to take part in local shopping experiences. From millennials to older generations, chinese tourists embrace mobile payment to make purchases when they are traveling overseas. In 2018, mobile payment in the Chinese outbound tourism market saw an increase in both the rate of use and the proportion of transactions. More than two-thirds (69%) of Chinese tourists paid with their mobile phones while abroad, up 4 percentage points from the previous year. On their most recent trips overseas, Chinese tourists surveyed paid for 32% of transactions using mobile payment, overtaking cash for the first time. 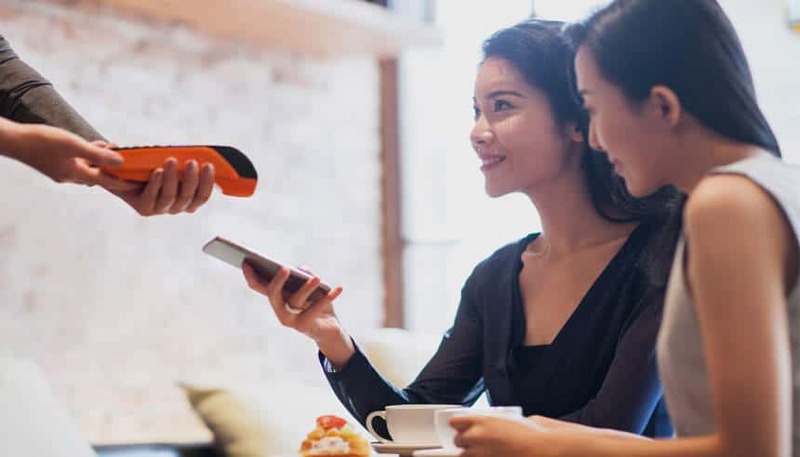 Although Chinese millennials are undoubtedly spearheading the uptake of mobile payment, they can no longer claim to be the dominant user group. Mobile payment has been widely adopted by Chinese tourists of various ages. For instance, 68% of Chinese tourists who were born between 1960 and 1979 used mobile payment while traveling abroad. Mobile payment boosts chinese tourists’ spending and vitalizes local businesses. According to the survey, 94% of Chinese tourists would be more willing to pay with their mobile phones if this payment method becomes more widely adopted by local merchants in overseas markets. At the same time, 93% of them would likely increase their spending if mobile payment were more widely accepted—a higher figure than that in 2017’s survey. Not only does mobile payment provide a convenient option for Chinese customers, but it also helps boost sales for local merchants. 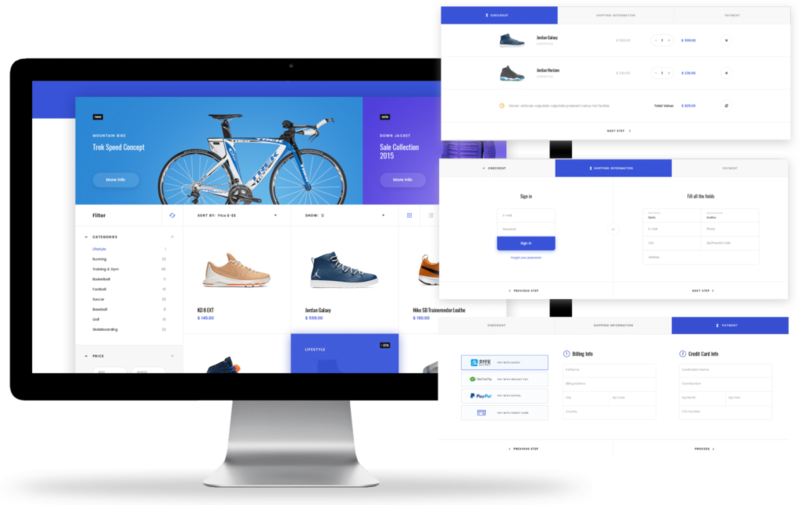 For example, nearly 60% of surveyed merchants that adopted Alipay experienced growth in both foot traffic and revenue after their mobile payment systems were implemented. As mobile payment becomes a routine way for chinese tourists to make purchases, adoption by overseas merchants accelerates. Currently, 58% of merchants located in areas frequented by Chinese tourists in Singapore, Malaysia and Thailand accept mobile payment, with 70% of them accepting Chinese mobile payment. By comparison, only 12% of them accepted Chinese mobile payment in 2016, underscoring the exponential growth of Chinese mobile payment platforms in overseas markets over the past two years. The merchants said they installed the Chinese mobile payment solution because they understood how routine it was for Chinese tourists to pay for purchases with their mobile phones. 90% of surveyed merchants in Singapore, Malaysia and Thailand encountered Chinese customers that asked if mobile payment was accepted in their stores. Looking forward, more overseas merchants would leverage the popularity of chinese mobile payment platforms to increase sales. Chinese travelers are now using mobile payment all over the world. 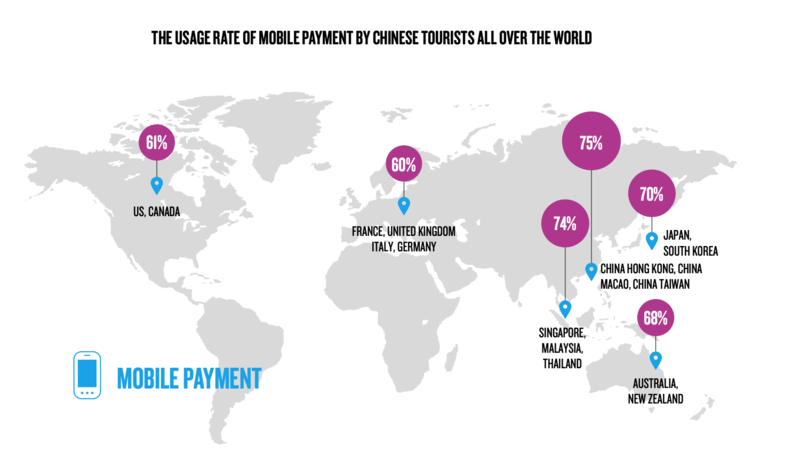 In 2018, over 60% of Chinese tourists made payments with their mobiles in locations ranging from Singapore, Malaysia and Thailand to Europe, the United States, and Australia. With the increased usage of mobile payment overseas by Chinese tourists and a deeper understanding of Chinese mobile payment brands by existing merchants, more merchants are willing to adopt Chinese mobile payment solution. According to the merchants surveyed in Singapore, Malaysia and Thailand, 60% of those who have already adopted the Chinese mobile payment solution is likely to recommend them to their vendor peers. Of those yet to accept mobile payment, 55% are very likely to accept Chinese mobile payment solution in the future.